Brewholder News: Starting off 2018 Right! Iron Hill will roll out their “winter 2018 lineup with the release of cult favorite, Rising Sun: a single-hopped IPA with the intensely tropical Sorachi Ace. For the first time in the brewery’s 21-year history, ‪Iron Hill‬ will place year-round emphasis on their canning program by releasing at least one canned beer every month. Rising Sun will be the first canned offering in 2018, followed by Bedotter (‪February 8‬) and Ore House IPA (‪February 22‬), with more fresh beer coming out throughout the year. 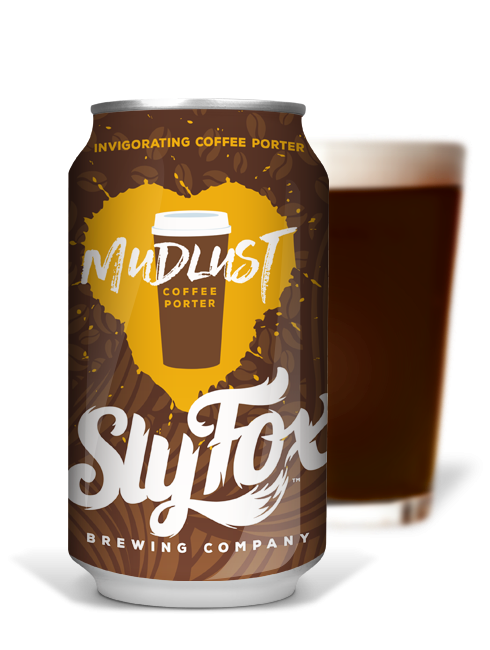 Sly Fox has been busy in early 2018. On January 20, they will host their annual Robert Burns party at the Phoenixville Pub, with the release of their Gang Aft Agley Scotch Ale. The Brewers of Pennsylvania announced their winter beer selections for 2018 – which is your favorite? Southern Tier announced new DIPA project – Southern Tier announced new DIPAs in a press release this week – “Southern Tier Brewing Company introduces a new 16oz can Double India Pale Ale collection. The brand new “Science is the Art” Collection showcases their brewers’ scientific exactitude through distinctive commissioned artistry. Featuring vibrant and energetic graphic novel-like labels, the collection will feature six expertly crafted, flavorful episodes that depict a short story throughout 2018. The first episode titled ‘All is Well at the Station’, is set to release early-January. In the midst of the electronic onslaught of blog posts, tweets, and visual inundation of digital photos on Instagram, Facebook and Snapchat, every once in a while it is refreshing to just sit and read a physical book while enjoying a well-crafted beer. 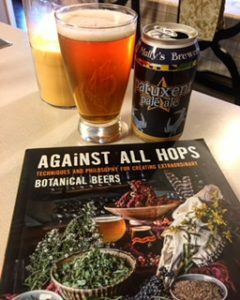 My most recent foray into physical media was “Against All Hops – Techniques and Philosophy for Creating Extraordinary Botanical Beers,” by Butch Heilshorn, the co-founder of Earth Eagle Brewings located in Portsmouth, New Hampshire. Against All Hops at its core is a recipe book for some of the brews that Butch and his team have created at their brewery. At the outset, be warned – the recipes are for advanced brewers and the book does not get into introductory methods of brewing, cleaning, or sanitization. The book is a fantastic read because, if you are not familiar with Earth Eagle Brewings, their brews use more than just hops in their beers. Butch has embraced the use of locally foraged herbs and plants in his beer, with the help and knowledge of his herbalist wife April. While the book contains recipes for their interpretation of standard styles (IPA, Stout, Pale Ale), generally Earth Eagle Brewings beer can be described as “gruit,” an ancient ale that did not use hops as the bittering agent. Instead, all manner of herbs, flowers, and other plant matter are used to create new and interesting tastes. Each recipe is prefaced with a enlightening discussion on the history, tastes, and medicinal qualities of the herbs used in the brew. Along with high-quality photographs of the plants, it makes for an extremely enjoyable read. 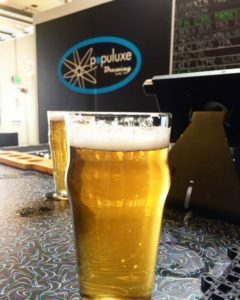 In addition to the recipes, Butch explains his philosophy on brewing, which is most definitely on the artistic side of the brewing spectrum (as compared to the technical, scientific side where large, industrial breweries necessarily reside). His concept of humanity’s connection to Earth is well presented, without being judgmental or overbearing, and is clearly reflected in the recipes for his beer. I thoroughly enjoyed reading Against All Hops, especially in the cold of December and January when thoughts of foraging for locally harvested herbs and plants seem to warm you from the inside. While the book is meant for brewers, anyone who has an appreciation for creative and well-crafted beer would probably enjoy reading the narratives between the recipes. As a home brewer, after reading Against All Hops, I am truly looking forward to trying my hand at a gruit with some home grown herbs this Spring – and maybe a trip to New Hampshire this year to try these recipes for myself! Against All Hops is available on Amazon in paperback for $12.91 and on Kindle for $9.99. As 2017 comes to an end, I am reflecting on the beers I experienced this year. In fact, I made a “trailer” of many of the beers I enjoyed and breweries I visited in 2017. You can view it on my Facebook page. Thanks to everyone that shared those beers and experiences with me! The highlights? Finally making my way out to Brew Gentlemen in Braddock, PA; two trips to Seattle and amazing beers at Populuxe Brewing and Urban Family; toasting at the last Real Ale Fest at the old Yards Brewing location; and celebrating Oktoberfest with traditional German style brews and cuisine at Weeping Radish on the Outer Banks. Of course, my list wouldn’t be complete if I didn’t add my interviews with the most influential brew writers in Philly beer history – Lew Bryson, Don “Joe Six Pack” Russell, and George Hummel; and I can now say that I interviewed “The Most Interesting Man in the World”! I am ready to celebrate the beginning of 2018. After all, I’m looking forward to checking out the brew scenes in St. Augustine, Tucson, Washington DC, Bar Harbor, and Nashville this year! But closer to home, I’m truly curious what 2018 will bring. Locally, I saw a few things that gave me pause for concern his year – Prism Brewing closed after moving to its long awaited new location; Beergeeknation stopped reviewing beers this fall; and Philly Beer Scene has reduced its activity on social media and in publication, as well as the cancellation of the Band of Brewers final competition in November. Could this be the prophesied “bursting of the bubble of the craft beer scene” in the Philly area? 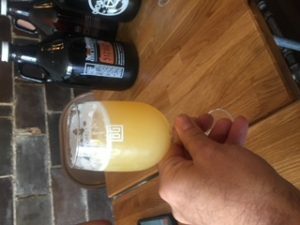 I don’t think so – we all know there were plenty of new breweries that opened this year, tons of new beers introduced, and lots of new places to drink them. Could it simply be a changing of the guard in the Philly beer scene? Or maybe a decrease in the excitement surrounding new beers? Is A-B InBev silently winning the market share war by continuing to purchase breweries like Wicked Weed and releasing catchy “Dilly dilly” commercials? Who knows. All I know is that every time I hear about a new local beer or brewery, I still get that thrill of excitement and adventure – especially when I can share those beers with friends and other like-minded beergeeks! I for one will not give up on my beer quest. It is my New Year’s resolution to continue to celebrate this golden age of American brewing! I will continue to check in on Untappd, post on Instagram and Facebook, and upload posts right here on theBrewholder.com. I hope you will continue to join me in 2018! Cheers to 2018; cheers to the small local breweries living their dreams, and cheers to craft beer! See you out there in 2018! Thanksgiving Eve events and new releases are ready to make you extra thankful this holiday! Have a peaceful Thanksgiving! 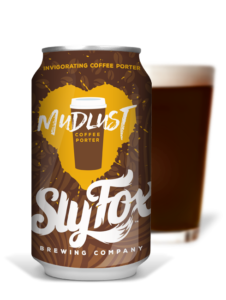 Sly Fox Brewing Company released its “Hop Project No. 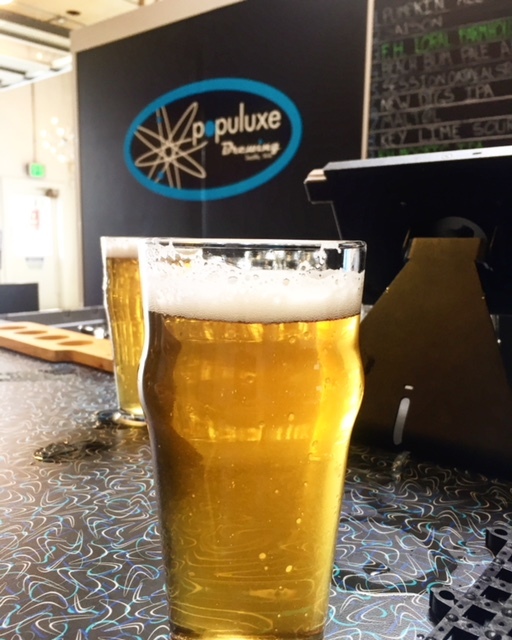 004 Pils” today. The press release describes it as “Hopped exclusively with the prized noble German variety, Tettnang, and packaged unfiltered, No. 004 is a majestic Keller Pils bringing a lively lager to the Hop Project series.” Try it soon at their Pottstown and Phoenixville locations, or in cans at select locations…. Riverhorse Brewing Company will hold its “Out of the Cellar” event on Saturday, December 9 from 7 – 10pm. “All of our most limited beers from throughout the year – together at one event! !” Tickets went on sale on Saturday, November 18 – follow this link to get them soon! Levante Brewing Company’s Firksgiving Eve (Wednesday, November 22) will be an opportunity to enjoy their brew and help others at the same time. According to their release, “A free 10 oz. pour of “Citra Hop Necessity” to anyone who walks in the door. Also, if you bring a new unused toy to donate to “Toys for Tots” we’ll hook you up with a $5 crowler or $10 growler fill of Citra Hop Necessity. This is our small way of saying thank you from Team Levante for your continual support of what we do. Helping Other People (H.O.P.) is a built into our mission, so let’s fill up the donation bin with toys and send you home with some hops! Stay posted for announcements on 2 specialty firkens for the event. 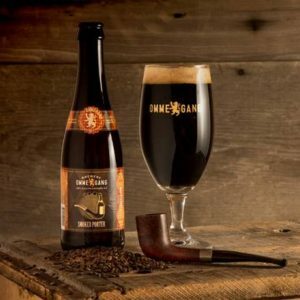 Have you tried Brewery Ommegang’s Smoked Porter? Looks like a perfect beer for the cooler weather…. (COOPERSTOWN, NY) As cooler weather settles in on the northeast, Brewery Ommegang is pleased to introduce their latest limited edition brew: Ommegang Smoked Porter. This nod to a traditional English beer is brewed with subtle additions of smoked malt and a touch of Saaz hops to add additional depth and character to an otherwise traditional English brew. While the style is a departure from Ommegang’s traditional Belgian-style beers, the characteristic aromas of chocolate malt along with caramelized sugar are reminiscent of many things Belgian, and of all things good. Smoked Porter is available now in limited quantities in four-packs and on draft while supplies last. Smoked Porter is brewed with a carefully crafted blend of Pilsner, Special B, Munich 20, Cara-20, Midnight Wheat, chocolate malt, and smoked malt. Balanced hopping is achieved with Saaz, while fermentation with American ale yeast ensures the malt remains in the spotlight. This 7.6% ABV beer pours a deep dark brown – almost black – with a thick tan head. Aromas of cocoa, burnt sugar, and roasted malt give way to subtle hints of smoke. The flavor follows the aroma with rich notes of cocoa and roasted malt, followed by caramel sweetness and mild smoke. A medium-full body leads to a well-rounded finish with lingering smoke on the backend. Smoked Porter is a wonder accompaniment for a variety of foods. Pair smoke with smoke – and enjoy with smoked meats and cheeses. It’s also an ideal charcuterie beer, and a wonder pairing for rich confections like chocolate cheesecake. Troegs Brewing Company has released its Anthology Winter Variety pack – which includes Troeganator Bock, Blizzard of Hops IPA, Scratch 307 – Cherry Chocolate Stout, and Perpetual IPA. Troegs’ holiday favorite Mad Elf is also out in abundance, and a new, exciting release of Mad Elf Grand Cru can be found! It’s truly the most wonderful time of the year! Keystone Homebrew Supply will celebrate its 25th anniversary this Saturday, November 18, from 2 – 9pm. They’ll be pouring wine, cider and brews, and some local breweries will be there too! Live music by The Counterparts, food from The Pizza Wagon, games and giveaways will round out the day. Details can be found on their Facebook page. 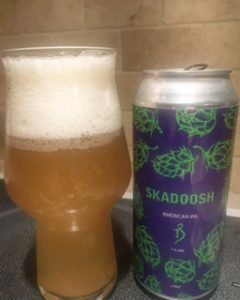 Skadoosh IPA by The Alchemist – thanks! Special thanks to a secret source who shared two amazing brews with me from The Alchemist Brewery in Vermont – Skadoosh IPA and The Crusher IPA. Oh – and a Super Session #8 IPA from Lawson’s Finest Liquids! What a great IPA week! 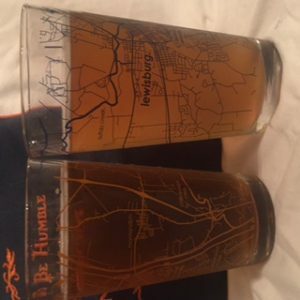 As college football bowl season swings into high gear, Uncommon Green has launched its College Town Maps line of glassware, a collection of pint glasses that are painted with a detailed map of your favorite college town. The selection of colleges is wider than expected – not only are large schools like Penn State and USC available, but also smaller institutions like the Patriot League’s Bucknell University and Lehigh University. Simply search the alphabetical list of over 100 college towns on the website to find your favorite. If your college town doesn’t appear on the list, follow the instructions on Uncommon Green’s website and they will create it for you. The pint glasses come in a set of two, painted in two official school colors. The maps are detailed enough that you can find your old local pubs and fraternity / sorority houses, and maybe even retrace a walk of shame. The colors included in the Penn State set (white and blue) and the Bucknell set (orange and dark blue) are vivid and accurately depict the colors of those schools. They are advertised as dishwasher safe; attempts to scrape portions of the roads away from the State College glass with a fingernail proved fruitless. The Bucknell pints are ready for another run to the NCAA tournament! 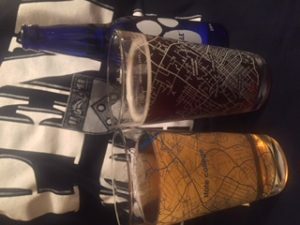 At $28 per set, these pints will remind you of your time at college and are the perfect gift for the thirsty alum. The College Town Map designs are also available on rocks glasses and stemless wine glasses – but etched into the glass rather than painted. The rocks and stemless wine glasses are sold at $14 per glass. 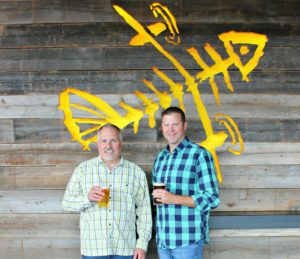 Gene Muller and Lou Romano of Flying Fish Brewing Co. Photo courtesy of Flying Fish Brewing Co.
November 9, 2017 – SOMERDALE, NJ –New Jersey’s largest and most award-winning craft brewery, Flying Fish Brewing Co., which just celebrated its 21st anniversary, announces the appointment of Lou Romano as President, effective November 20, 2017. 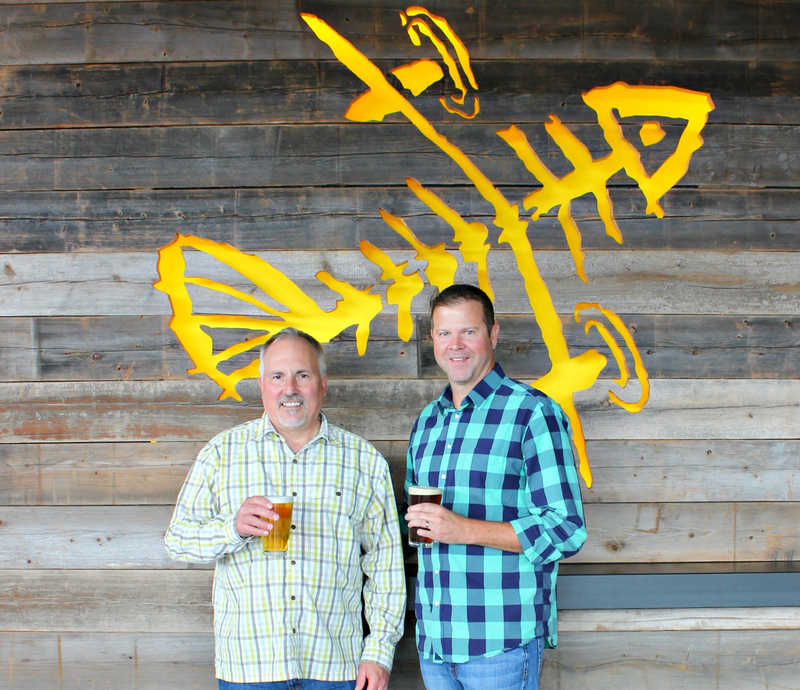 Gene Muller, long the face and voice of Flying Fish, will assume the official full-time role of Founder, remaining heavily involved in all areas of managing the Flying Fish brand, focusing on special projects and lending expertise in an advisory capacity. Flying Fish currently produces approximately 25,000 barrels per year and primarily distributes within a four-state area. Romano, who began working in the beer business at age 16, comes most recently from Oskar Blues Brewery, where he served as National Sales Manager since 2013. Before that, Romano served in a variety of capacities, including Director of Marketing & Wholesaler Development, for D. G. Yuengling & Son. Other relevant experience includes Resort Beverage Company, West End Distributors and Nittany Beverage. Romano’s hiring is the culmination of a three-month search, during which several candidates from top-tier craft breweries were interviewed. Philly Beer Scene’s Band of Brewers final competition planned for November 5 was postponed. Keep your eyes open for the new date! Riverhorse Brewing Company will hold their Stoutfest on Saturday, November 11. There are still tickets available online – follow this link to order tickets and more information! Philly Beer Week has launched their annual Brew with a View Raffle! If your ticket gets selected at the drawing on November 15, you’ll be heading to Brouweij De Brabandere in Belgium to brew a collaboration beer with the local brewery of your choice. One ticket costs $5, but you can buy 5 for $20. Purchase your tickets online here – quickly! Brewery Ommegang has released its newest Game of Thrones Beer, “Winter is Here.” It is available now in bottles and on draft. Read my previous article about it here, and look for my first impressions of the brew this weekend on Instagram, Twitter and Facebook when I crack my bottle open! Southern Tier has expanded its Pittsburgh Taproom with a 7000 sf outdoor patio. I was there last summer before the addition, and now I can’t wait to get back! Read the press release here. complete with executive chef, private event space and state-of-the-art brewhouse. This November, Yards Brewing Company will open Yards Brewery and Taproom at 500 Spring Garden Street in Philadelphia’s beer-savvy Northern Liberties neighborhood. The highly-anticipated expansion and move from their cozy tasting room on Delaware Avenue further establishes Yards as “Philadelphia’s Brewery” and provides them with a new 70,000-sqare-foot facility to produce their approachable ales and lagers, with a canning line slated to arrive in early 2018. Located less than six blocks from the famed Liberty Bell in downtown Philadelphia, Yards is the most recognized brewery in the city, and one of only a handful of urban, regional breweries in the entire United States. Chef James Burke, a James Beard Award semifinalist and prominent face in the city’s culinary scene, will helm the first kitchen in the brewery’s 23-year history. Chef Burke’s diverse menu will complement and incorporate the choice hops and grains used in Yards’ award-winning beers, with special attention paid to local purveyors, Philly favorites and classic pub fare. The menu will be divided into Snacks, Sandwiches, Entrees and Desserts; and the kitchen will serve food until one hour before closing time. The bar will feature 20 total taps: including all Yards signature beers and a number of limited releases only available in the taproom. Chef Burke has been a visionary in the city’s diverse culinary scene for the past 15 years and he has worked alongside nationally acclaimed chefs and forward-thinking restaurateurs, including Daniel Boulud, Marc Vetri and Stephen Starr. Helming the kitchen at Yards Brewery and Taproom will be a homecoming for Chef Burke in Philadelphia, where he was a three-time semifinalist for the James Beard Award as chef-owner at JAMES.